Over the week of Jan 15 to 22, three condominiums in the Core Central Region (CCR) saw transactions that were not just the most profitable, but also set record prices. The Marbella, at Mount Sinai Rise in prime District 10, is a 239- unit, freehold condo developed by OUB Centre and completed in 2005. The latest unit to change hands in the project was a 1,744 sq ft, four-bedroom unit on the 23rd floor of one of the three 24-storey towers. The unit at The Marbella was sold for $3.2 million, or $1,830 psf — which is a new high in terms of psf price. The sale price was 2.3 times the purchase price of $1.4 million ($803 psf) that the former owner paid in November 2002, according to a caveat lodged then. The seller also pocketed $1.8 million from the sale — which was the highest gain registered for the week under review (See Gains & Losses Table on Page EP9). Another profitable deal that week was for a unit at Emerald Garden on Club Street in District 1 of the CBD. The 265-unit, 999-year leasehold condo was completed in 1998. It is regarded as one of the first inner-city private condos in Singapore. 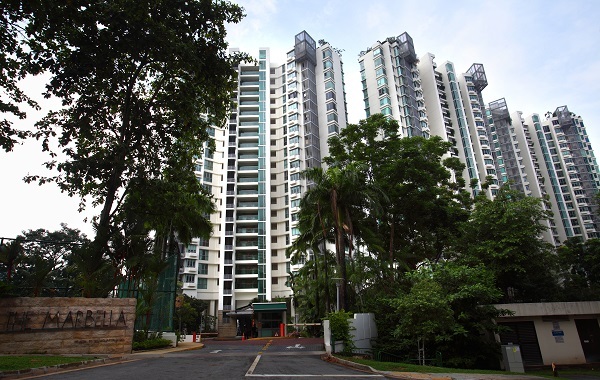 The unit at Emerald Garden is a 1,238 sq ft, three-bedroom apartment on the second level of the 11-storey condo block. The sale price was $2.6 million, which translates into $2,100 psf — also a new high in psf price terms. For the seller, who had paid $935,000 ($755 psf) in December 2002, it meant a capital gain of $1.67 million. The third most profitable deal was at 28 Shelford, a freehold development that was completed in 1994. Located on Shelford Road, off Dunearn Road in prime District 11, it is a boutique, low-rise condo block with just 36 units.